Tip: Using our medical, plumbing, or hvac answering services? Have on-call staff? Use our free online on-call scheduling software to alert us in real time who is on call. Set your on-call schedule as far out in advance as you want. The text message you receive from the answering service will begin with the text, "Reply with xok," where ‘x’ will be a single digit number. For example: "Reply with 1ok." This code is followed by the contents of the detailed message taken by the answering service. To easily confirm receipt of the message, simply reply with "xok," where ‘x’ is the single digit. 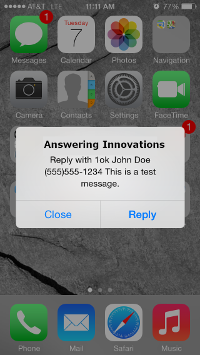 John Doe – Answering Innovations 555-1234 Re: Test message"
The reply that you will send back to confirm the message has been received would be: 1ok. In the sample urgent protocol listed below, the answering service operator will send a text message with confirmation to the on-call staff member and wait 15 minutes before proceeding to step #2 to call the on-call staff member's cell phone. If the staff member replies to the text message with the confirmation code 1ok within 15 minutes, our system automatically receives the response and marks the message delivered. If we do not receive confirmation in 15 minutes -- or any time period that works best for you -- the message ticket will pop back up to the answering service agent, who will proceed with the next step of your urgent protocol. Confirm receipt of answering service messages in a matter of seconds. The instant you reply with the short sms confirmation code, we know you have received the message and that the message is delivered; we know to stop going down your urgent protocol list. Don't worry if you can't get to the phone right away. In some cases, such as while driving, it might be dangerous to answer the cell phone to receive a message from the answering service. In other cases, a phone call might be inappropriate, interrupting you in the middle of a job or in a social setting. Receiving a text message gives you time to quickly but safely remove yourself from any situation, read the message, and confirm receipt. Clichéd but true: time is money. And it takes time for the answering service operator to call out to deliver you a message, especially if multiple attempts are required to reach your staff. On the other hand, our agent can send a text message with confirmation in about a second. 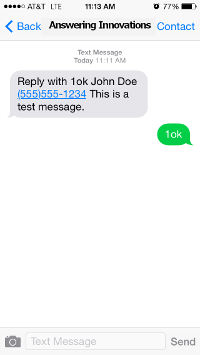 Text messaging with confirmation is cost-effective, fast, and easy.